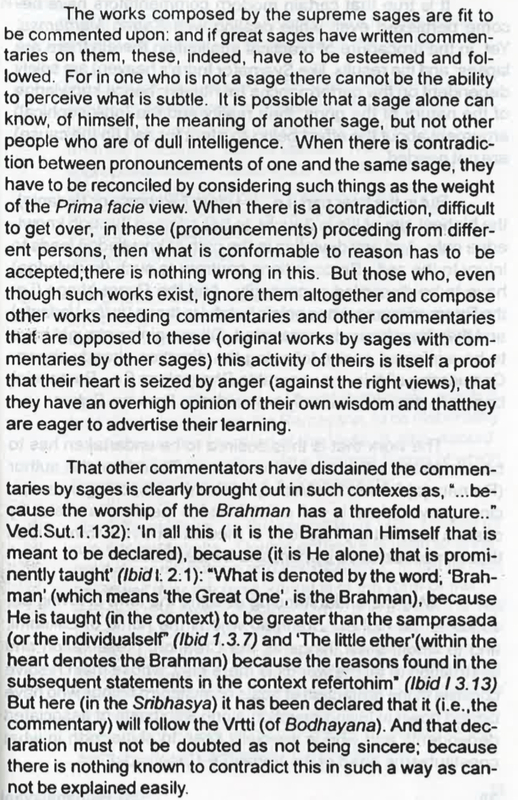 The works composed by the supreme sages are fit to be commented upon; and if great sages have written commentaries on them, these, indeed, have to be esteemed and followed.... That other commentators have disdained the commentaries by sages is clearly brought out in such contexts as “because the worship of the Brahman has a threefold nature”, “In all this, because that is prominently taught”, “What is denoted by the word Brahman, because he is taught to be greater than the Samprasada”, “The little ether because the reasons found in the subsequent statements in the context refer to him”. But here (in the Sri Bhashya) it has been declared that it will follow the Vritti. I’m interested in the part in bold. Sudarshana Suri says “other commentators”, but I think he’s referring to the Advaita philosopher Adi Shankaracharya here. He’s pointing out various examples of passages in Adi Shankaracharya’s Brahmasutra Bhashya where Adi Shankaracharya disagrees with Baudhayana’s Vritti. My question is, what are each of the passages that Sudarshana Suri is referring to? The second part of the Sûtra is explained in a different manner also, as follows: Characteristic marks of the individual soul as well as of the chief vital air are not out of place even in a chapter whose topic is Brahman. How so? 'On account of the threefoldness of devout meditation.' The chapter aims at enjoining three kinds of devout meditation on Brahman, according as Brahman is viewed under the aspect of prâna, under the aspect of pragñâ, and in itself. The passages, 'Meditate (on me) as life, as immortality. Life is prâna,' and 'Having laid hold of this body it makes it rise up. Therefore let man worship it alone as uktha,' refer to the prâna aspect. The introductory passage, 'Now we shall explain how all things become one in that pragñâ,' and the subsequent passages, 'Speech verily milked one portion thereof; the word is its object placed outside;' and, 'Having by pragñâ taken possession of speech he obtains by speech all words &c.,' refer to the pragñâ aspect. The Brahman aspect finally is referred to in the following passage, 'These ten objects have reference to pragñâ, the ten subjects have reference to objects. If there were no objects there would be no subjects; and if there were no subjects there would be no objects. For on either side alone nothing could be achieved. But that is not many. For as in a car the circumference of the wheel is set on the spokes and the spokes on the nave, thus are these objects set on the subjects and the subjects on the prâna.' Thus we see that the one meditation on Brahman is here represented as threefold, according as Brahman is viewed either with reference to two limiting conditions or in itself. In other passages also we find that devout meditation on Brahman is made dependent on Brahman being qualified by limiting adjuncts; so, for instance (Kh. Up. III, 14, 2), 'He who consists of mind, whose body is prâna.' The hypothesis of Brahman being meditated upon under three aspects perfectly agrees with the prâna chapter; as, on the one hand, from a comparison of the introductory and the concluding clauses we infer that the subject-matter of the whole chapter is one only, and as, on the other hand, we meet with characteristic marks of prâna, pragñâ, and Brahman in turns. It therefore remains a settled conclusion that Brahman is the topic of the whole chapter. The translator says in a footnote that this is the explanation given “by the Vrittikara”, i.e. Baudhayana. Ramanujacharya agrees with Baudhayana’s explanation of this Sutra; see this section of the Sri Bhashya. The highest Brahman only is what is to be meditated upon as distinguished by the attributes of consisting of mind and so on.--Why?--'On account of there being taught here what is known from everywhere.' What is known from all Vedânta-passages to be the sense of the word Brahman, viz. the cause of the world, and what is mentioned here in the beginning words of the passage, ('all this indeed is Brahman,') the same we must assume to be taught here as distinguished by certain qualities, viz. consisting of mind and so on. Bhûman can mean the highest Self only, not the vital air.--Why?--'On account of information being given about it, subsequent to bliss.' The word 'bliss' (samprasâda) means the state of deep sleep, as may be concluded, firstly, from the etymology of the word ('In it he, i.e. man, is altogether pleased--samprasîdati')--and, secondly, from the fact of samprasâda being mentioned in the Brihadâranyaka together with the state of dream and the waking state. And as in the state of deep sleep the vital air remains awake, the word 'samprasâda' is employed in the Sûtra to denote the vital air; so that the Sûtra means, 'on account of information being given about the bhûman, subsequently to (the information given about) the vital air.' If the bhûman were the vital air itself, it would be a strange proceeding to make statements about the bhûman in addition to the statements about the vital air. “The little ether because the reasons found in the subsequent statements in the context refer to him”: This is Adhyaya 1 Pada 3 Sutra 14 of the Brahma Sutras. Adi Shankaracharya interprets this Sutra as saying that when Dahara Vidya of the Chandogya Upanishad speaks of Akasha or ether/space, it’s referring to Brahman and not actual Akasha, because later on in the passage it is contrasted with actual Akasha. For the text carrying on, as the subject of discussion, the ether that is the abode of heaven, earth, &c.--by means of the clauses, 'In it all desires are contained,' 'It is the Self free from sin,' &c., and the passage, 'But those who depart from hence having discovered the Self, and the true desires' (in which passage the conjunction 'and' has the purpose of joining the desires to the Self)--declares that the Self as well, which is the abode of the desires, as the desires which abide in the Self, are the objects of knowledge. So I guess Sudarshana Suri is saying that Tanka is also a Rishi. Whew! It’s interesting to note, by the way, that these four Sutras are in order. So Sudarshana Suri might have written up a longer list and then chosen the first four to serve as examples. Not the answer you're looking for? Browse other questions tagged vedanta sri-vaishnava adi-shankaracharya brahma-sutras vishishtadvaita .